**This post contains affiliate links and I will be compensated if you make a purchase after clicking on my links. These small commissions help keep Remodelicious running and we appreciate your support! My kids are insanely spoiled on custom shirts and other goodies. They suggest a shirt and hours later, there it is. Hot off the craft-cutter, they are sporting new Valentine’s shirts to school today after announcing that they needed “Valentine’s shirts with hearts that say ‘love’ on them”. I really need to add custom shirts to my Etsy shop! Cricut’s new Access™ subscription helps your readers get the most out of their Cricut® machine. Starting at only $7.99/month, Cricut Access™ members get exclusive benefits, including 10% off all orders on Cricut.com and in Cricut Design Space™! This new subscription service will also allow them to be the first to access new images, projects, and exclusive designs. * Just tell your readers to look for the Access™ icon to find projects and images included in Cricut Access™. 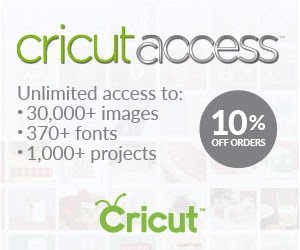 *The 10% off discount is only applicable on Cricut.com (USA and CAN only) and in Cricut Design Space™. The 10% off cannot be used to purchase or renew Cricut Access™, to purchase Cricut Circle™, or on iOS in-app purchases. This change does not require any action from current subscribers. Terms and Conditions apply. How did you cut out the font inside the picture? I just got a cricut and I’m just learning! Great shirts!